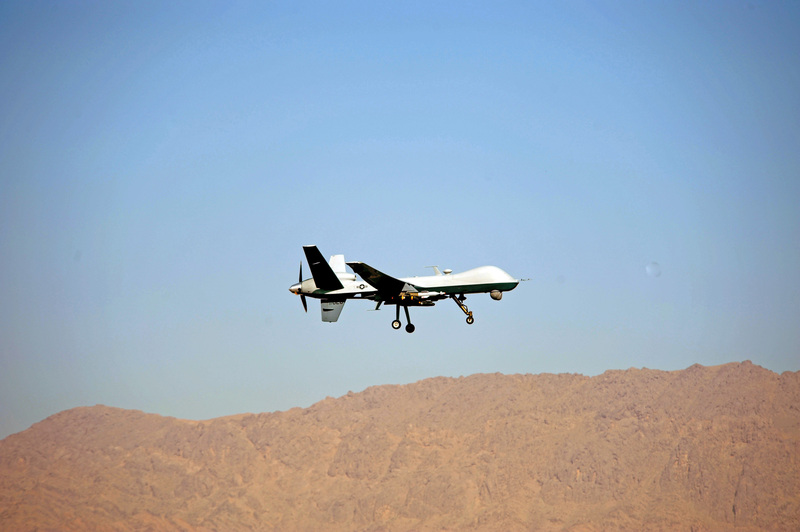 ← Drones for the ICC and Drones for Human Rights? I watched Mark Hanis last night on RT defend his and Andrew Strobo Sniderman’s op-ed article in the New York Times, which I responded to yesterday. Given the salience of this debate, I thought I’d share a few more thoughts, this time on the misconception that the missing ingredient in human rights advocacy and enforcement is surveillance of human rights abuses. Hanis and Sniderman start from a premise with which virtually every human rights advocate agrees: there remains a worrying level of inaction in the face of atrocities being committed around the world. Again, no one disagrees. They’ve got the diagnosis right. It’s their prognosis that’s wrong. History presents a litany of sombre cases of mass atrocities that have been met with shamefully inadequate responses: we know the tragic lack of response to the Rwandan genocide and the deafening silence on the alleged counter-genocide in its wake in the Democratic Republic of Congo (DRC); Darfur is consistently decried as a situation where the international community has made a mockery of the mantra, “never again”; seemingly more people are interested in whether it is called Burma or Myanmar than responding to systemic human rights abuses there; the situation in the DRC, where violations of rights pretty much dwarf all other contexts, barely registers in public opinion; this week, international leaders hunkered down for the intense process of diluting their response to the crisis in Syria because they’re unable to do enough, but unwilling to do nothing. The list goes on; it’s not pretty. But before you go jumping on the “humanitarian drones” bandwagon, here’s the critical question: would any of the above situations have been different if we just had more precise aerial surveillance of violence and human rights abuses? Let’s look at the record. 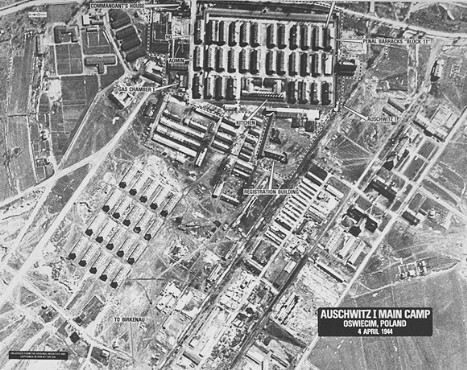 An aerial photo of Auschwitz from 1944, more than a year before the war - and the Holocaust - ended. It is worthwhile remembering that there were aerial photographs, as well as personal testimony of Nazi concentration camps, including Auschwitz and Dachau. Winston Churchill called Auschwitz “probably the greatest and most horrible crime ever committed in the whole history of the world.” Despite having seen the evidence and having been implored by various groups to take action, Allied powers did nothing. Both the UK and the US rejected any plan to bomb either the concentration camps or the railway lines that satisfied the camp’s insatiable appetite for human slaughter. Faced with unmistakable aerial surveillance and witness-based evidence, the Allies chose not to bombard the camps. Remarkably, that was during the war, when Allied planes were already bombing other Nazi targets. In Darfur, a project called ‘Eyes on Darfur‘, sponsored by Amnesty International, uses satellite imagery to map systematic violence in the region. While not of the precision that drones offer, it isn’t clear that this surveillance of human rights abuses has done much of anything to mobilize and instigate effective action in Darfur. Even the Bush administration’s acknowledgement that Darfur constituted a genocide – as controversial as that decision may be – didn’t lead to an effective response to resolve the conflict. In addition to satellite images, aerial photography also illustrated the violence between South Sudan and Sudan last year, detailing burned down and abandoned villages. Unlike the satellite images in Darfur, the aerial images from Abyei were detailed close-ups and demonstrated with clarity serious instances of indiscriminate violence against civilians. Still, South Sudan and Khartoum appear as close to the brink of war now as they did before. I could go on, but the point is this: what is holding states back from responding effectively to instances of mass human rights violations is not the lack of precise aerial photography. It isn’t insufficient information or knowledge of atrocities that keeps the international community from taking appropriate action. It is conflicting interests and the lack of political will amongst states that keeps them from taking their obligations as precisely that – obligations. It is also often the complete misunderstanding of the political context in which violent conflict and atrocities occur that leads states to remain unconcerned or take inappropriate action. Indeed, such misunderstandings can be made worse by distilled and decontextualized images – as powerful and evocative as they may be. As I said in my earlier post, this is not to reject the idea that aerial images – including those produced from drones – can’t complement other forms of evidence and testimony. Aerial photographs are already part of a collage of sources which help the public to mobilize and the international community to respond to widespread human rights abuses. But the idea that “humanitarian drones” could be a panacea to the lack of political will and interest that plagues states from taking action to address atrocities is a misplaced pipe dream. So before you go writing to your favourite human rights group or the United Nations to request that they spend big parts of their budgets on “drones for human rights”, think long and think hard: are drones really the answer? This entry was posted in Darfur, Drones, Holocaust, Human Rights, Justice, Southern Sudan, Sudan. Bookmark the permalink. 7 Responses to Drones for Human Rights: Are Drones the Answer? Many of the instances of atrocities e.g. Bosnia, Holocaust and others were instances where, yes, as you point out, governments possessed certain or near certain information indicating widespread abuses. Yet it may not have had an effect. But this was because government chose whether to publicize that information and so controlled supply so as to moderate the demand for intervention or another remedy; depending on the political benefits from disclosure/non-disclosure. If they wanted to justify an intervention in a particular state, they might be more generous with ‘informing the public’. Where there was no benefit, those images might only be disclosed sparingly. However, if NGO’s and other ‘keen’ groups get access to such drones, it is likely that their incentives are usually in publicizing such images and so it is almost certain that those same photos will eventually get to larger segments of society and may therefore have greater impact – kind of like an implosion of freedom of the press. There will be many more images of many more conflicts. In fact, competition between NGO’s to get ‘into the action’ would only reinforce this feedback loop. Privatization of drones will not only increase the supply (for the common man) but probably also the quality of images and surveillance. I have not come across anyone pushing for this who argues that UAVs are a panacea. They have the potential to be another tool that may help gather evidence and push it out to the world, to make a clearer argument for engagement. They can complement other sources to provide a clearer and faster picture of what is happening. Often this record is established months or years after the fact (if ever) by research on the ground by HRW, ICC. The faster and clearer we determine who is doing what and make sure that decision-makers (and decision ‘pushers’) are faced with clear facts of mass atrocities taking place, the more chance we have of spurring appropriate action, even if it’s against miniscule odds of success. UAVs combined with other sources offers at least the possibility of doing this in higher resolution and in near real time. In terms of the human factor, I think it can complement it if done well. For example, Sat Sentinel uses imagery to corroborate on the ground evidence, without which it may be discounted as hearsay. An activist can say they saw what looked like a mass grave at a military compound, but without access to independently verify, those words don’t carry much weight. Remote sensing is one way to do that. It doesn’t replace the human element, it helps verify it. While I absolutely agree the people we are fighting for must be engaged with as real flesh and blood and not pixels, it doesn’t mean we should ignore new tools for protecting them for fear of minimizing their suffering. It does mean we have to be smart about how we use them. For your argument saying that, well, credible evidence is already being collected by brave human rights activists risking their lives… exactly. Many are killed or tortured doing precisely this. They shouldn’t have to, when possible. Similarly, a civilian who witnesses a murder at a convenience store may be able to provide eyewitness testimony that indicts a criminal. But so might a security camera installed above the counter. The latter doesn’t care if it is shot while watching. We have far too few data points to judge the prospects of remote sensing for behavioral change by perpetrators. I don’t find your logic very convincing on Darfur and Abyei. You make the leap that since it looks like war on the horizon Satellite Sentinel must have failed. By that marker we should abandon journalism all together because it has had no affect in stopping the war. But we don’t because we understand that it is a small factor in shaping public and expert opinion on appropriate policies or action. Sometimes it spurs outrage, and sometimes not. Anecdotal evidence suggests Sat Sentinel may have had a slight behavioral impact on the Sudanese government, who has attacked the project and allegedly tried to hide a mass grave from satellites by moving a water tower. They at least know they’re being watched- whether they care is a valid point, but not really the point (they know military intervention is off the table and they have little reason to care about ICC indictment). Recent analysis by Sat Sentinel last year was cited by the ICC as justification of an arrest warrant for senior Sudanese leadership. Finally in terms of Auschwitz this isn’t very convincing as a lesson in what is possible- since imagery was not made public by the government until after the fact. It is impossible to know what impact (if any) showing aerial photos of death camps would have had on public opinion at the time. Admittedly probably not much. But more to the point, we’re coming off of 60 years of changing norms on human rights and a globalized media. We don’t measure the potential for our actions by how the public might have responded 60 years ago. As I wrote in the post previous to this one, I do not disagree that sharper imagery, including from drones, cannot complement other types of evidence. There are certainly a number of mapping projects which are quite helpful in highlighting and categorizing human rights violations, such as the LRA crisis tracker and the Satellite Sentinel Project. However, I disagree that it is the precision of imagery offered by drones that is the missing key to taking effective action to stop atrocities – or adjudicate them at the ICC. I think, Michael, we actually don’t disagree on this point. I largely concur that drones have little to do with human rights enforcement. I also worry that an over-dependence on imagery decontextualizes and depoliticizes the nature of human rights violations occurring, which can both impede action and result in poorly considered intervention. There seems to be a tendency to believe that more information means better outcomes. But what matters is the quality of the information. Photos, however precise, can only tell you so much about what is taking place. There is a vast literature on this, ranging from photos of concentration camps following their liberation to photographs of torture in contemporary times. Michael – I think you’ve misread what I said about the Satellite Sentinel Project. I do not suggest that they failed because of the possibility of war between South Sudan and Sudan. I can’t claim they failed at all because, in line with my views on ‘humanitarian drone’ imagery, I don’t think that their work alone can be responsible for preventing conflict. In fact, in what they aim to do – highlight and map instances of atrocities and human rights abuses – they are quite good. There, I think we would both agree. You say that you don’t buy the logic that the technology offered by drones marginalizes evidence from people. I’ve racked my brain over this for a while now, but I can’t think of one activity where drones are employed that doesn’t marginalize the human element. My point isn’t that using ‘humanitarian drones’ would marginalize people, but that those who espouse their use risk overlooking the human experience and evidence that is so crucial in achieving effective responses to and adjudicating atrocities. I’m not sure what you mean entirely with your video-camera/robbery analogy. Ideally no human would be witness to atrocities because there would be no atrocities. However, human witnesses will always exist so long as human rights abuses are perpetrated. It is their testimony and experience that must be respected above all else, certainly more than a video camera or a photograph. I disagree with your views on taking lessons from the past, even if they are 60 years old. That the Allies were in possession of images and knowledge of the horrors at Auschwitz yet did nothing, to me, is quite telling – even if all the variables don’t fit neatly onto the ‘humanitarian drones’ in Syria example. Further, while you’re right that the public did not know of the photographs, stories, including first hand accounts, about the Holocaust and the atrocities committed against Jews, homosexuals, gypsies, etc. were regularly reported in newspapers. Again, thanks for taking the time to comment. I’m glad that you felt – like I have – passionate enough to raise your voice and debate these issues. I’m happy that this space is one where topics like this have been debated freely and at some length. When has an ‘over-dependence on imagery’ decontextualized or depoliticized human rights violations? For who? I’m unfamiliar with any examples. How could having more precise images of what is occurring impede action or make intervention more ‘poorly considered’? Confused on this point. What I want to know is simple: first, do you believe that a hypothetical BBC cameraman hiding in the bushes outside of Douekoue in Cote D’Ivoire, recording Ouattara’s forces while they were going house to house killing 800 civilians in Douekoue last year over the course of several days, sending the footage over satellite modem the first day to the BBC, UNOCI headquarters and viewed by Outarra himself, would without a doubt not have had any effect on the behavior of said rebel soldiers or commanders then or in the future? Second, how is hiding the exact same camera up in a tree to record remotely fundamentally different? Or let’s say, I don’t know, on a drone? We have yet to see a single instance of using the resolution (and video!) offered by a drone to try to do live monitoring of the above. When we do we can analyze the experience and see whether it dehumanizes or depoliticizes, and how effective it is at halting atrocities. Then let’s have this discussion about whether or not they are an effective tool, or have deleterious effects. I don’t find theoretical angst compelling when we have yet to have even a single example of someone trying! I meant that, all things being equal, we should minimize risk to civilians as witnesses. A video of a particular general directing his troops to torch a market may be all the ICC needs for an arrest warrant for war crimes. It could be taken by someone hiding in their house, or a remote camera. Expecting a civilian to have to put themselves at risk is unfair. If it can be done the same by an alternative method we should push for it. And finally to respecting testimony being paramount, no. It’s the events that are taking place that must be stopped, above all else. As much as Rwandan genocide survivors I’ve interviewed cared about how much I respect their testimony ten years on, they would have been a wee bit more thankful if I had shown up with a camera while it was happening. If having that camera on a drone provided better access to quickly understanding the scope of roadblocks, killings, and seeing tens of thousands of people gathered on a hill for a week waiting to be killed (Murambi), even if the impact on public opinion or foreign policy would have been marginal, then without any doubt in my mind we should have used them. Thanks again for the thoughtful comment, Michael. I am enjoying this back-and-forth. I actually think images of atrocities almost always decontextualize and depoliticize the subject they’re looking at. Barbie Zellizer has a great book on how this happened with images of liberated concentration camps – who was in the photos, why they were there, which concentration camp it was, etc. were very often neglected. Instead, the images became part of the iconongraphy of the Holocaust. Images of Darfur are often very decontextualized as well. It’s not clear who the victim is, where they are from, etc. 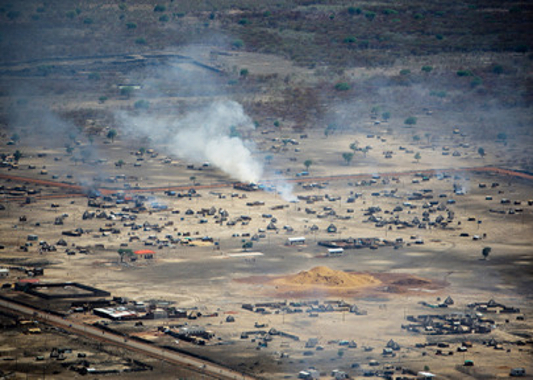 Taken alone, the images of Abyei don’t actually say anything about who burned down the village, why that village, etc. This is what I mean by decontextualizing and depoliticizing the subject-matter. Now, and I really want to stress this point, the above doesn’t mean that photographs/imagery lose their utility. The iconography of the Holocaust is extremely powerful, even if we don’t know who is in the photos or which camp is being depicted. Same goes for images of Darfur, South Sudan, etc. But I truly believe that for effective action to take place you need to understand the political context in which violations are taking place – who is committing atrocities and to whom, why are they doing it, have they done it in the past, is it in the context of a conflict or not, what are the causes and dynamics, etc. When that isn’t known, it can create calls for inappropriate types of action – for example, action that focuses exclusively on one side or, as both Darfur and Rwanda show, action that paints the commission of human rights violations as being one easily defined group against another easily defined group. My worry is that relying more heavily on precise images offered by drones – while useful in mapping and accumulating evidence – contributes, rather than remedies, the problem of decontextualization by making our understanding of what is going on a matter of the number of guns, pools of blood and bodies. I think the cameraman is likely to have an effect on the behaviour of those committing crimes so long as those committing crimes were aware of the cameraman. Same would probably be the case for drones. But I do not believe it would have a deterrent or necessarily positive effect. Rather, the commission of atrocities would move to locations where they were not so visible, where neither cameras – from a man or from the sky – could reach. I agree that potential harm to civilians should be minimized. But it’s not like we either send in humans or send in drones. The evidence that we see in places like Syria, Libya, etc. is accumulated by civilians actively engaged in rebellion and who want to communicate what is happening to the rest of the world. I think you’re wrong to think that having ‘humanitarian drones’ would take them out of the picture and out of harm’s way. Again, I was not saying that testimony should displace responses to mass atrocities. So on the last point, I’ll just have to reiterate that, to me, the adjudication of international crimes must, absolutely must, be centered around the experience of victims, witnesses and survivors. Anything that threatens their centrality to international justice, in my mind, should be questioned. Again thanks and looking forward to your response! Ok, I certainly agree that images in general decontextualize. Any image by itself does this, whether it’s the Biafra skeleton child or a satellite photo. Doesn’t a very personal photo decontextualize as much as the latter, at the other extreme in trying to understand a complex political struggle through the lens of personal suffering? The two together, along with other sources, might help build a more complete and accurate story. Your analysis is still talking about the hypothetical things people who use these tools might do, not the tools themselves, which leaves me no room to argue. I can’t argue against the fact that two people can make totally different and sometimes silly analyses of a situation looking at the same information, or be irresponsible in obtaining it, or rely on some sources and not others, or cherry pick the facts. Let’s separate out the information question from these underlying structural and political analysis problems. Do we believe better data might help overcome some of this extreme divergence in understanding of even the basic reality of a situation? I do. How do we present information to the public about Sudan or Congo in a way that is accurate but doesn’t overwhelm, and spurs (what we believe to be) appropriate action? I don’t know. I’m not sure the guns, pools of blood bit was the most helpful line for the authors’ case. You’re right that this alone would likely lead to oversimplifying the situation in a negative way. But again, as part of the bigger picture it may say something that testimony or photos may not. On the cameraman and altering behavior- you’re setting the barrier for success unrealistically high. My definition of success is precisely what you suggest. If a rebel commander says to himself, “well I’m being watched in this village. I better not attack it,” that is success. Most atrocities happen within the context of an ongoing military situation, not for atrocity’s sake. Douekoue for example, was on the main route to Abidjan for Ouattara’s forces. A commander is unlikely to waste days attacking villages far outside of this route, but may give his troops carte blanche to take care of any civilian opposition during the fighting. As such changing his calculus, if only for that single village, would be a significant tactical success. You further make the case for a remote option in that such monitoring of a village would only be helpful “as long as those committing crimes were aware of the cameraman”. I absolutely agree. In the hypothetical case of the BBC cameraman if the rebels were aware of him he would most likely have been shot and the information would never get out. We’re more likely to be in a situation to capture something useful, and less likely to endanger a civilian or journalist, if we have multiple options that might serve to deliver that cameraman’s function. I actually think we are in agreement on most. If done it would have to be tried extremely cautiously for all the reasons you make clear. I think the major difference is the lens we view its use through. I don’t primarily see it as an international justice issue, which is a far longer term perspective in terms of halting behavior of atrocity. I view the problem through more of a tactical lens, which assumes we have some power to halt the act itself. As such there are three goals: 1. using knowledge of being monitored to change perpetrator behavior during an event, 2. Helping build a clearer picture of events so that advocates can more quickly and accurately build a case for international action and pressure and 3. Using the possibility of knowledge of being monitored for future behavioral change and altering the calculus of perpetrating atrocity at the command level. That really is the holy grail. While it may remain a pipe dream, and UAVs might not be the answer or a miniscule part in it, I believe strongly that we have to carefully try and analyze every potential option for improving all three.